No matter what you have to give, be it time, money, or potential collections items, we'd love to hear from you. Click on the links below for more information. You can make an impact for preserving the Ardens’ community history by supporting your museum and its historic collections, including the archives, photographs, educational and children’s programs, scholar research accessibility, informative visitor tours, exhibitions and curatorial programs by making your donation or gift to the Arden Craft Shop Museum, Inc.
Much of the three Ardens history started well over 100 years ago and it is up to all of us to ensure that the museum and its collections are here for the next 100 years and for our future generations to enjoy. See the many creative ways to give below. 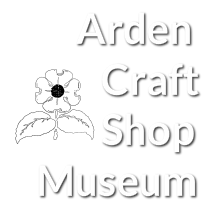 If you shop on Amazon.com, your purchases can now benefit the Arden Craft Shop Museum! Part of your purchase will be donated to the ACSM at no additional cost thanks to the AmazonSmile program. Share this link with your friends and family, and they can support the ACSM too! The Arden Craft Shop Museum has t-shirts and hats from last year's Arden Fair for sale in the gift shop. Stop by today to find your size!